You'll need a rectangular serving tray (at least 9"x 13") Start from the bottom and work your way up with the veggies. First layer is the "tree trunk." Place green pepper slices vertical at the bottom end of the tray. Next add a short row of cucumbers followed by a longer row of cucumbers. This will be the longest part of the veggie tray and each row will get shorter as you go to create the tree shape. The next row will be the baby carrots. Place them vertically above the cucumber slices. Angle the edge carrots slightly to give the tree some shape. Next row above the carrots will be the sugar snap peas. Lay those vertically and make the row slightly shorter than the carrot row and also angling the outer edges with a few snap peas. Above the snap peas, layer the slices of red peppers vertically. Above the red peppers, make a row of celery sticks. Again, make sure each row is slightly shorter than the last and angling the outer pieces. Finally, top it all off with a cheese star. 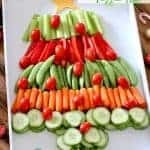 Use the cherry tomatoes as "ornaments" and dot them all around the veggie tree. Serve with 1 (14 oz.) tub Marzetti® Ranch Veggie Dip. This can be made a day ahead of time. Wrap tray tightly with plastic wrap and keep cool in the refrigerator.